Who should be the female rival and who should be the male rival? Heya. We thought for a while, and decided to make a challenge of our own which will involve a little Danganronpa V2: Goodbye Despair crossover! A Danganlocke V2, I guess. You can only catch the first Pokemon in each route. If a Pokemon faints, it must be boxed. Dupes and Shiny clause is on. When a character is voted, we will not be allowed to switch to another one. All characters must have a rule that reflects their personality and/or talent. We must follow the Pokémon types of the said characters. Through a randomizer, we will be allowed to add one more character option from previous games/anime series/manga. 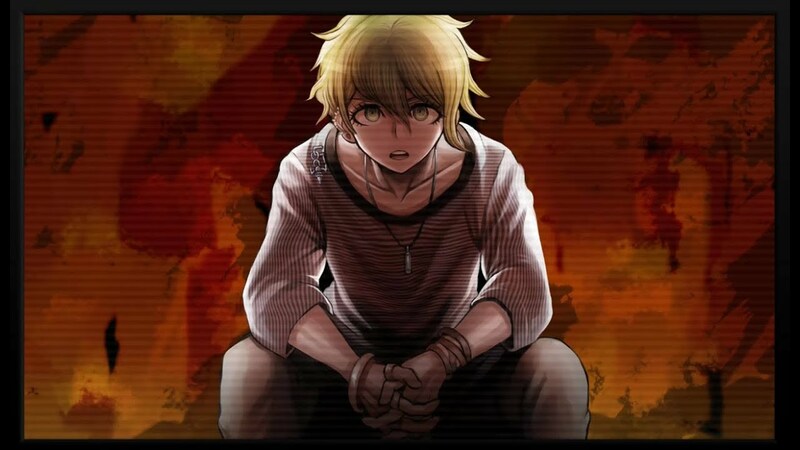 Considering that this is a Danganronpa V2 crossover, the characters can be given the title "The Remnants of Despair" after their team dies; the traumatic experience of them losing everything - along with their hope - made them turn to despair, worshiping it and spreading it around like wildfire. This, however, will change things drastically for the gameplay. They will only use Dark, Poison, and Ghost-types. They won't heal their Pokémon during battle. They won't switch their Pokémon during battle. They will only be able to use moves that deal damage. No status changing effects or the like. Due to the events of Danganronpa 3: Despair Arc, Chiaki is unable to enter this mode. Due to Junko already being Ultimate Despair, if voted, we will have to follow every rule that the "The Remnants of Despair" are given. Only able to use Pokémon with the Naive, Serious and Careful nature. All of his moves during battle will depend on luck. See here. He will not be allowed to evolve his Pokémon. Allowed types: Steel and Electric. Only allowed to heal mechanical-like Pokémon during battle. Only allowed to use Pokémon of the Calm, Serious, Careful, Lash and Brave nature. Only able to heal his Pokémon with consumables like barries, water, etc. inside of battle. Must have at least some barries at hand at all costs! Allowed types: Fighting, Ground, and Rock. Not allowed to switch Pokémon during battle, as he wants to train them to become the strongest. Due to being sensitive about his child-like face, he is not allowed to use baby Pokémon or overall "cute" ones. Only allowed to use moves that do damage. Due to how sleepy Chiaki always is, a roll will determine if she will be able to attack or not. 1~3 is yes, 4~6 is no. Being a foreigner, Sonia's speech may be messed up. A roll will determine if she will able to communicate with the nurse in the PokéCenter and PokéMall. If failed, she will not be given their services. Allowed types: Fighting and Psychic. Her cruel nature may scare off the Pokémon she's trying to catch. A roll will determine this. Allowed types: Flying, Bug, Water. She will have higher demands for male Pokémon, giving them fewer rights to healing items, etc. during battle, unlike female Pokémon. Allowed types: Normal and Psychic. Due to years of taking care of herself due to her injuries, she will not be allowed to go to the PokéCenter to heal her Pokémon, and instead, use healing items. Being a coward, she will always run away from a fight if one of her Pokémon has low HP. Only allowed to use Pokémon with the Bold, Naughty, Hasty, Sassy and Jolly nature. Allowed types: Steel and Fighting. Believing herself to be nothing but a tool, she sees herself as someone less than a human being. Inferior. Her Pokémon must have at least one status effect move each that lowers or boosts attack/sp. attack/defense/sp. defense. Every Remnant of Despair trait is given to her. Allowed types: Rock, Ground, Fighting, Steel. Her military training made her a brutal lady, she will never back down from a fight by fighting every single trainer, never switch Pokémon and always use fighting moves. She knows the weaknesses of her opponents and will never use an attack that's "Not very effective" if possible. That's all, folks. Vote for the character that you wish us to play as. changed my vote to Chiaki, cause i like her character more!! It was the year 2045 on the planet we call Earth. Our home. The sun was shining brightly on the land and sea, warming them up while they were in its gentle grasp. Pokémon and humans alike were playing about, in larger cities, beaches, forests and in towns. Nuvema Town was fairly small, with only a few inhabitants, some of the children playing in the sun with their Pokémon as their parents watched from afar. However, there was one particular person who hasn't been doing so- instead liking the company of video games and unhealthy snacks rather than actual people and Pokémon. Chiaki Nanami. From a young age, she has been known as the local shut-in of Nuvema Town. A loner. Unlike her peers, owning a Pokémon wasn't of any interest to her. She always kept up the belief that even if she did get one, she wouldn't get far. As the cold breeze of air flew into her room from the open window, she could only shiver under her blanket as she sat in front of her console. "LEVEL UP!" Yelled the robotic voice of the console, Chiaki's expression unchanging as her furious tapping on the controller persisted. Her fingers didn't hurt. She removed her hand from the controller to reach a hand into her bag of chips until- THUD! She could feel the wind from her room's door hit her as it was swung open. This startled her, making her let out a gasp and scoot back towards her bed. "That's it!" The elderly woman yelled. "I'm sick and tired of your constant video games! You're going outside!" Without being given a second to talk, Chiaki was grabbed by her hand and dragged outside her dark room, into the bright hallway. She placed a hand over her eyes to shield herself from it, looking towards the elderly woman who let go of her as soon as they entered the living room downstairs. The tired teen let out a yawn, rubbing her eyes with her hands. "... What's this all about, mom...?" She queried in her soft voice, her expression that of confusion. "You were never angry over me about video games..." She sighed, her arms falling to her side. She was wearing nothing more than a plain white T-shirt and denim shorts, the blanket she had over her now on the floor. "Do you see those kids?!" Her mother yelled, pointing outside, making Chiaki lazily turn her head to the outside scenery. "They're actually being productive! You haven't done anything for four years straight other than play your video games and only got out of your room when you had to go to the bathroom!" The lady was furious, Chiaki unmoved. "I asked Professor Juniper to get a Pokémon ready for you." She explained, the teen's brow raising in intrigue. "Pokémon? You know that I don't want anything to do with them, right?" She let out a sigh, placing a hand on her face as she pinched her nose for a moment, closing her eyes during the process. "I don't care! You have to do something with your life!" She crossed her arms. "The professor also said that you'll get your Pokémon in a day or two, so you better get ready. Pack up your stuff too." The girl only nodded as her mother explained the situation. "Okay." She simply replied, starting to walk back to her room and not bothering with picking up the blanket from the floor. The day passed just as usual, Chiaki played her video games till eventually falling asleep. wowy i love this! your writing is honestly very smooth ^^ this challenge is so exciting, i really like how we'll get to experience everything through Chiaki's eyes. can't wait for the next! The crossover I never knew I needed but now need intensely. Thank you everyone for all of the support! The next part will be uploaded tomorrow when the rival votes will set in! Chiaki was awaken by a loud knock on the door. "Chiaki!" Her mother yelled, her voice muffled behind the door. "Chiaki wake up and get ready!" The girl slowly started to open her eyes, rubbing them with her hands as she let out a yawn of exhaustion. "Yeah, yeah..." She muttered to herself, slowly getting out of bed and onto her feet. "I'm going..." She continued, starting to change into more 'adventarous clothing', as her mom put it and walked out of her room. Her mom was standing by the door, her face red from anger. "You're lucky that I decided to wake you up!" She sighed, shaking her head. "Juniper sent two other kids your age to hang out with you. You're going to have a good time, got it?" The woman glared. "You never said anything about that..." Chiaki rolled her eyes in disapproval. "That's because I want you to socialize. So you aren't taking your video games with you!" The mother yelled. "Stop yelling already..." She pinched the bridge of her nose. "And fine, no video games." She let out a yawn, rubbing her eyes again. "They'll come any second now, so clean up your room and make them feel welcome!" With that, she stormed off. Chiaki stood in front of her room for a split second before turning around and letting out a sigh. She looked at the bag on her desk, her lips going to the side as she looked at her portable consoles that were scattered around her room. She smiled a little bit and grabbed them, pretty much shoving them into the bag along with a few chargers. Her mom isn't going to tell her what to do! After that was over with, she started to tidy up her room; it wasn't long before a few knocks were heard at her bedroom's door. They were softer than usual, so it mustn't be her mother. Chiaki walked towards the door and slowly opened it. And so their eyes met. "Hi!" The other girl smiled, she had short red hair styled into a bob, freckles, a bright smile and beautiful gray eyes. "You must be Chiaki, right?" Another noticable feature is the camera around her neck, which caught the gamer's attention for a split second. "Yes." The girl nodded in response to the other's question. "My name's Mahiru Koizumi." She extended a hand out. "Nice to meet you." Chiaki was a bit surprised, but took the girl's hand and shook it. "Professor Juniper sent me here. She said that you'd be great company." Mahiru smiled. Although Chiaki doubted that, she gave the girl a nod. "Yeah... sure." She stepped to the side. "Come in." With that, the photographer came into the room. "Pretty!" With that, she took a picture of the room with a bright smile on her face. That caught Chiaki off guard. "What're you doing?" She queried in surprise. "Oh, I'm taking a picture. I like to keep them as... you can't really relive this moment once you go through with it." The girl replied, turning around. "I see... but, hey, wasn't there someone else that has to come over? Mom said that there would be two." Chiaki showed the number two with her fingers in the form of a peace sign. Mahiru thought for a moment. "Yeah, now that I think about it... the Professor said that it's going to be some boy." She sighed. "No wonder he's late..." She placed a hand on her face in the form of a light facepalm. This made Chiaki think for a moment, but she didn't say anything until feminine laughter would be heard from downstairs- most likely from Chiaki's mom. The two girls looked at each other curiously and decided to walk downstairs, just to see a mother and a white haired boy about their age laughing as they enjoyed some tea. The two looked rather confused before Chiaki's mother spoke up. "Oh, hi sweetie! Meet the boy that Professor Juniper sent!" Now it clicked. Chiaki nodded and the boy got up, his hair was a messy and white, he had light gray eyes with a tint of green and a pretty chill expression. "Sorry for being late." He let out a soft laugh. "My name's Nagito Komaeda. Nice to meet you." He seemed to be holding some sort of box as well. "Professor Juniper asked me to bring this to you both. Our Pokemon are in here." He explained as he looked down at the box. "Let's go upstairs, shall we?" The two girls looked at each other before nodding, and the three went upstairs, into Chiaki's room. He placed the box down onto the desk that Chiaki had and opened it. Inside we're three Pokéballs. Chiaki stared at them. Mahiru smiled and took a picture of this little moment. "Exciting!" She exclaimed, looking it over on her camera. Chiaki looked at Nagito and Mahiru. "Should... I go first?" She asked, the two nodded. "Go ahead." With that, Chiaki looked at the three Pokéballs in front of her yet again. She reached out for one. This is the start of a new life, and one great journey. Seeing how winter break ended, me and Chloe will only really be able to post updates on Friday, Saturday or Sunday- about once or twice a week. The next update will be posted on Friday hopefully.